During the Thursday parliament session, speaker Hovik Abrahamyan considered reasonable the suggestions that a Heritage member be put in charge of a certain field and be part of the cabinet. Hovannisian said that he is constantly in touch with his party faction members and is well aware of what’s happening in the parliament. “The Armenian nation’s fight involves all possible constitutional ways and instances. It is commendable that there are de facto processes in the parliament, but those processes are not related to my approach as a citizen who has been granted your trust. I am ready to welcome any cooperation,” stated Hovannisian, official runner-up in the February 18 presidential elections challenging the incumbent president’s victory, and added that if Serzh Sargsyan has a suggestion on “accepting this pan-national victory and overcoming this unrest”, he is ready to hear him out, but that the parliamentary negotiations have nothing to do with him. To the question on Heritage party’s possible participation in the coming May elections of the city council, for which the ruling party on Thursday presented its list of candidates with Yerevan mayor Taron Margaryan in the leading position, Hovannisian said they would decide “after overcoming this national crisis”. “If the solution the people is demanding is not given to this, we will make the decision on our participation in all the other elections after that: city by city, town by town, village by village the people will re-instate its power,” said Hovannisian, adding that the issue of appealing the election results at the constitutional court will also be discussed, among others, during Saturday’s rally. 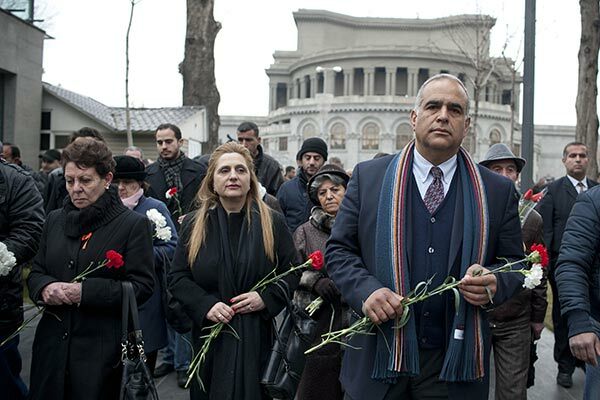 After the press conference, Hovannisian and his supporters went to Myasnikyan square, downtown Yerevan, to lay flowers in memory of the victims of March 1, 2008 post-election clashes.